Whew! The laptop finally cooperated enough that I could get in here and post this. I did make the mistake of watching A Baby Story on TLC (it was what was on when I turned on the tv while the laptop figured itself out). Now, I'm having a huge case of baby lust. It might also have something to do with the fact that my baby, turned 9 today. I can't believe how fast the years seem to slip by and before I know it, they're officially boys. I'm not even sure I can say he's a little boy. He's now officially boy. Happy Birthday, Roger. I'm so proud to be your mom! Note to self: Wipe down the towel cabinet. It seems the kitties have been up there with dirty paws or something. And as a surprise treat, I have a third picture for all of you! 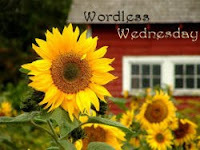 When I told Justin what the theme was for this week, this was his idea for a picture. I loved the idea and couldn't disappoint! That's the turkey that I bought from the grocery store deli yesterday! 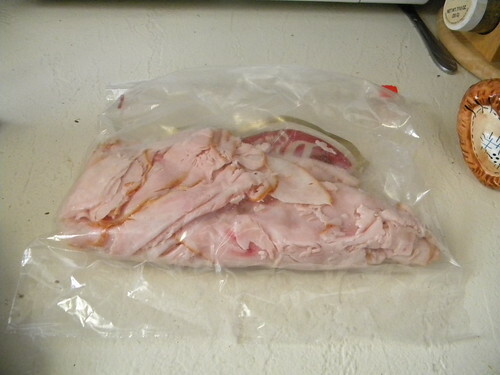 Speaking of turkey, it's lunchtime so I'm going to hit post and go make a sandwich out of that delicious bird! I love your color scheme. Not sure why but the brown and sunflowers are talking to me! What a creative interpration of 'birds'. 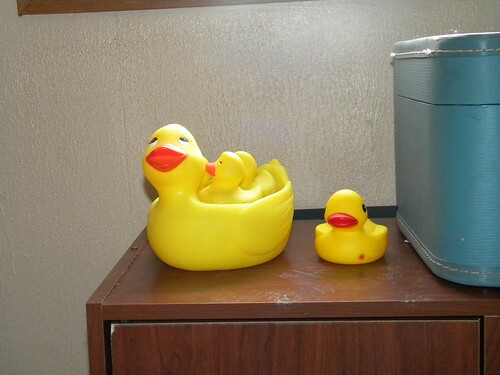 Love those rubber duckies! Happy Birthday to Roger! I'm not sure what I will do when my youngest becomes an official boy. Eeeek! Yeah, totally would be baby lust time! Just because, ya know? Nice interpretation of the assignment. I like it! And I'm totally jealous of all your cute ducks! I think the ducks here must get sucked down the drain (that or the kids eat them...either would be a strong possibility) because no matter how many I buy, they all seem to disappear. *shrug* Who knows? Anyhow, just wanted to drop by and catch the latest post. I am seriously loving the Google Friend Connect and the constant updates it gives for new postings! Too funny with the turkey. 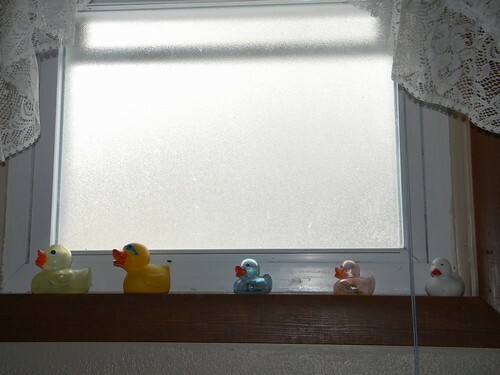 Love the ducks on the windowsill.